Cats and dogs are now living longer, healthier lives due to advances in veterinary care. The average lifespan is 13 years for dogs and 15 for cats. Though, in this day and age, it is not unheard of for a cat to live into their twenties or a dog to live beyond 15. Providing good health care throughout all the stages of your pet’s life is the best means of assuring an optimum lifespan. Early detection and early treatment of disease are particularly important in older animals. As your pet ages, you may observe physical signs such as cloudiness of the eyes, a thinning coat, decreased tolerance of the cold, prominent spine and hips, arthritis and joint stiffness, graying of the muzzle, muscle atrophy, and deafness. Behaviorally, an older pet may sleep more, become less active, and may seem more irritable. There are things you can do to help your animals live long, happy lives while they’re with you. You may need to feed fewer calories as your senior pet becomes less active. Regularly weigh your pet, and if he becomes overweight, talk to your veterinarian about changing the diet. On the flip side, a pet that is losing weight may need a more palatable diet because of his decreased senses of smell and taste. A dietary change may also be necessary if your pet develops diabetes, heart disease, or kidney disease. It’s also recommended to raise your senior pet’s food bowls to allow for easier digestion as your pet eats. Regularly engaging your senior pet in moderate play can promote muscle tone, increase blood circulation, and improve gastrointestinal mobility. Though, you’ll want to cut back on the distance and speed of your walks. Several short strolls instead of one long one are easier on the joints. During times of exercise, be alert to labored breathing or rapid tiring as this may suggest your pet has a disease. Talk to your veterinarian if these symptoms appear. Brushing stimulates blood circulation and sebaceous-gland secretions in the skin, creating a healthier skin and hair coat. While you are grooming your senior pet, look for unusual lumps, skin lesions, or external parasites. If you notice any of these, your pet should be examined by your veterinarian. You will also want to do your best to care for your senior pet’s teeth. Home dentistry consists of gently rubbing your pet’s teeth with a piece of gauze or specially designed toothbrush and paste made for pets. Teeth cleaning should be performed on a regular basis so it becomes a routine for both you and your pet. A senior pet should have semi-annual heath examinations in order for your veterinarian to notice early symptoms of some common diseases that affect your pet. Every six months may seem frequent, but remember that animals age six to 10 times faster than humans, so a biannual appointment for your pet is similar to you visiting your doctor once every three-four years. Talk to your veterinarian about special tests for senior pets. It’s also important to monitor your aging pet. Pay particular attention to changes in your senior pet’s behavior and alert your veterinarian to any changes, as they may be significant. 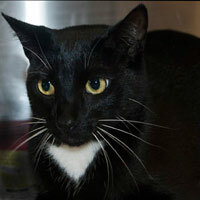 Felix, a slender short-haired black tuxedo cat with a white bib and paws, is friendly, energetic, and fun. This playful one-year-old will tap you on the arm as you walk by when he wants a bit of attention. He loves being petted and pampered, rewarding you with purrs and meows and rolling over onto his back. This indoor/outdoor feline gets along with children and other cats and will make a great family pet. The following is included in the adoption fee at ASAP: Spay or neuter surgery, flea treatment, vaccinations, microchipping, health evaluation, including testing for feline leukemia (FeLV) and feline immunodeficiency virus (FIV). Cats thought to be 10 years or older receive a full blood panel evaluation, thus assuring that the cat is indeed healthy and adoptable, some medical and drug coverage through ASAP’s vet, if necessary, and a temperament evaluation and cat carrier (you can save the county money by bringing your own).